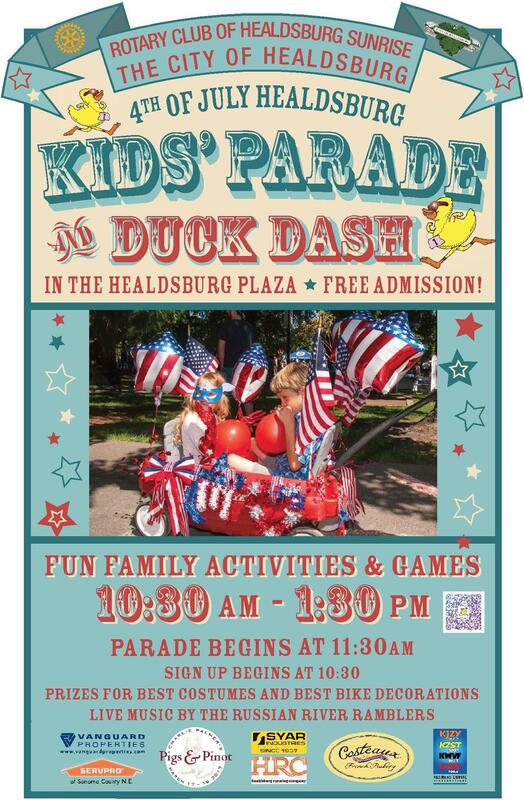 Join hundreds of other families and kids of all ages for the annual 4th of July Kids Parade and Duck Dash in the downtown Healdsburg Plaza on Wednesday, July 4th from 10:30am to 1:30 pm. In its seventh year, the event continues to be a major attraction for Healdsburg community to celebrate the founding of our nation. The event is presented by the Rotary Club of Healdsburg Sunrise and the City of Healdsburg. Youngsters are encouraged to dress in costume; arrive on bikes, tri-cycles and wagons adorned with red, white and blue decorations. There will be live music and activities for all including; games, races, face painting, and special guest appearances from Uncle Sam, the Russian River Ramblers and the Healdsburg Community Band. 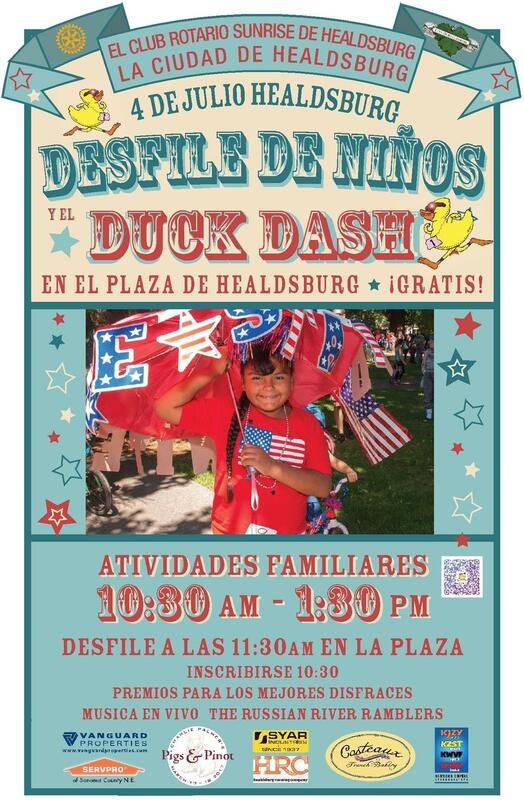 Throughout the day enjoy Duck Dash Races organized and promoted by Healdsburg Sunrise Rotary. Adopt a duck for $10 and watch it race to the splash zone. The fastest ducks will win fabulous prizes – bikes, tickets, gift cards, coolers and more! Proceeds benefit the good deeds of Rotary in the local community including scholarships, teacher appreciation, Choices Program, Wonder League and much more!